Why is there a disparity between the 2 Incoming Call UIs? When it is locked, you have to slide from left to right. When unlocked, you have to tap on the button on the right hand side. So, essentially, you are tapping on different sides based on the screen's lock state. Not a biggie, but isn't that an inconsistent interaction pattern? The "slide to answer" gesture remains consistent with "slide to unlock", and other shorthand gestures like sliding a text message notification to the right to unlock and go to that message. The "slide to" mechanism is a safety mechanism of sorts, to make sure you don't unlock or answer your phone while in your pants. Having just a tap to accept a call could pose a significant problem. 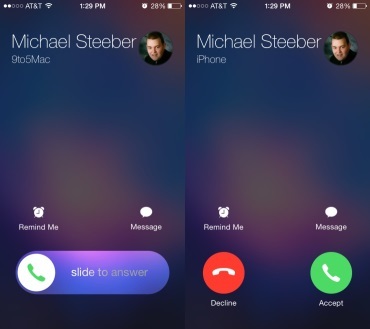 The start point of "slide to answer" maybe different, but it shares the same end point as "accept call". Your concern could be addressed by reordering the decline and accept buttons. But alas, Apple prefers the Cancel/OK sequence of buttons. Oh well... Hail Hydra Apple! Alternatives to More Tab Button in a UITabBar?